The world economy is experiencing important transitions and associated uncertainties. Commodity prices have fallen sharply, with adverse consequences for exporting countries. China’s rebalancing and the prospect of U.S. interest rate increases are having important and costly spillover effects on other economies. 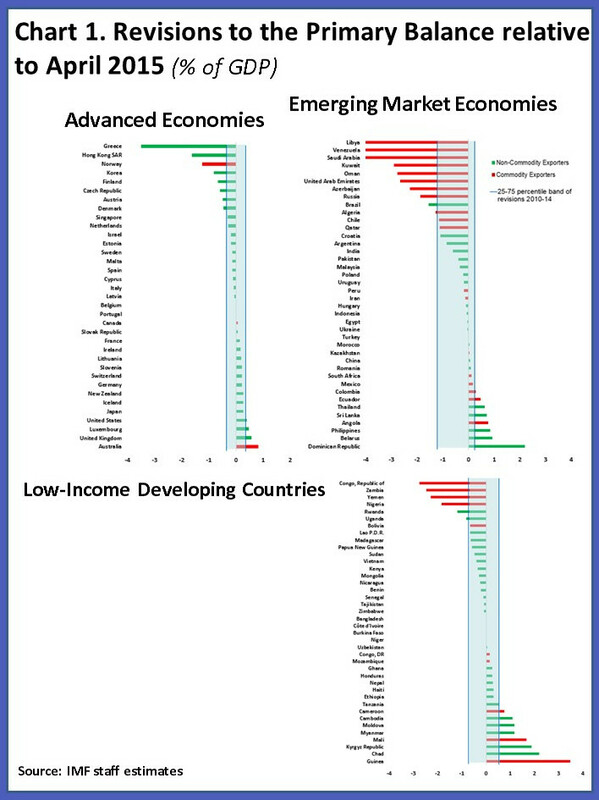 And these and other factors are posing important fiscal challenges, especially for emerging markets. Indeed, since our assessment in April, we have seen a significant deterioration in fiscal positions (measured by the primary balance) for emerging economies and for commodity exporting countries (Chart 1). And this has translated into higher levels of public debt. It is timely therefore that this issue of the Fiscal Monitor focuses on the conduct of fiscal policy under uncertainty, with particular attention to the uncertainty created by commodity price fluctuations. 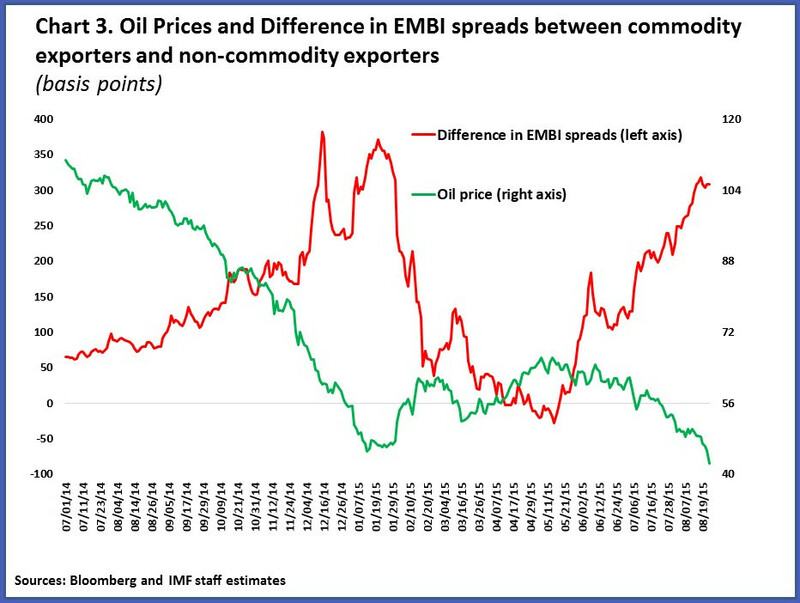 The recent sharp decline in commodity prices has reminded us that these prices are volatile and highly unpredictable. History tells us that commodity price booms and busts can involve prices moving by as much as 40 to 80 percent. Moreover, these movements can also be highly persistent. What we document is the fact that fiscal policy is key to the transmission of commodity price fluctuations to the rest of the economy. This occurs for at least two reasons. 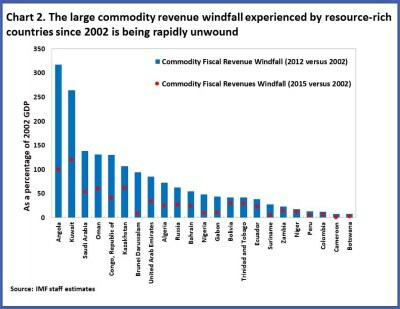 One, in countries where governments rely heavily on commodity revenues, commodity prices tend to cause large fluctuations in fiscal revenues. The second reason is that insulating government spending from volatile revenue has proved particularly difficult. As a result, spending in these countries has been strongly procyclical: increasing during price booms and falling during price busts. This time around is no different. The fiscal implications of the sharp decline in commodity prices are very large. The deterioration in the 2015 primary balance in commodity exporting countries is about 5 percentage points of GDP on average, with countries like Saudi Arabia and Venezuela experiencing a particularly sharp decline. 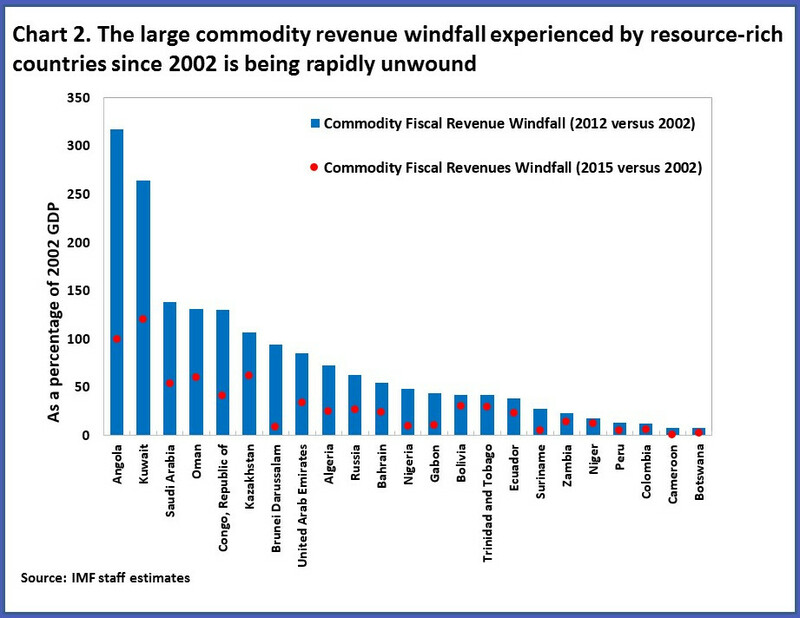 This reflects a massive reversal of the revenue windfall that commodity exporters accrued during the boom years. About half of this windfall has been reversed so far (Chart 2). And not only are revenues weaker, but external financing conditions in commodity exporting countries have tightened, making it harder and more expensive to finance spending (Chart 3). Indeed, global financial markets are particularly unforgiving—financial conditions tend to worsen significantly precisely at times when commodity exporters need financing. Those commodity exporters that built buffers during the boom years or had easier access to capital markets, such as Chile, the Gulf countries, and Norway have been in a better position to support government spending. In many other countries, however, budgets are under stress. 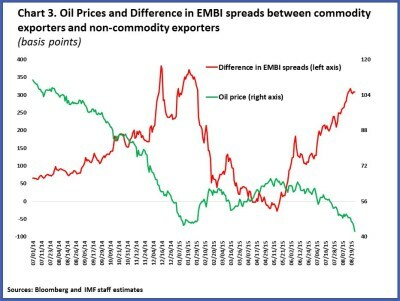 All commodity exporters will need to adjust public spending to lower commodity revenues, while safeguarding to the extent possible essential capital and social spending. The pace of adjustment will depend on the availability of buffers and market access. The latter crucially depends on the credibility of the fiscal framework. How about countries that are not commodity exporters? 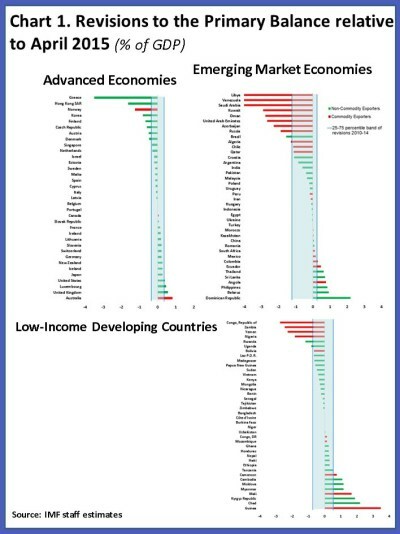 Fiscal balances in emerging market and low-income economies have also worsened, reflecting a combination of weak growth prospects and country-specific factors. More encouraging is that prospects in advanced economies remain broadly unchanged compared to April, as the modest recovery progresses broadly in line with earlier projections. But our long-standing warning about high public debt and its adverse economic impact remains very relevant. 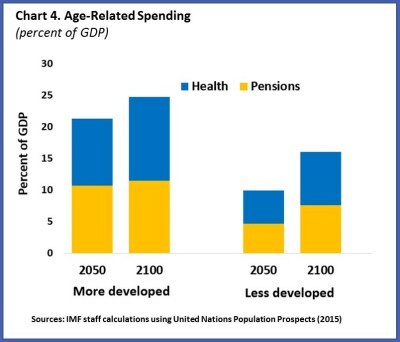 In advanced and in some emerging market countries debt levels have reached extraordinary levels, and—to make matters worse—these economies have huge future obligations from age-related spending. We estimate that health and pension spending will rise to 25 percent of GDP, by the end of the century, in advanced economies and 16 percent of GDP in less developed countries (Chart 4). We will present important new evidence of the fiscal implications of demographic trends at the end of the month in Tokyo. Given the magnitude of the challenges I just presented, the key question is: how can governments manage public finances to deal with these daunting long-term challenges, while also coping with the substantial near-term risks and uncertainties? One, budget revenues should be mostly derived from broad-based taxation, backed by strong compliance. In the case of commodity exporters, more efficient revenue mobilization can mitigate revenue volatility. One specific aspect is the taxation of multinational corporations. These reforms can be part of the fiscal adjustment strategies that commodity exporters will need to pursue. Two, improving the efficiency of spending, including energy subsidy reform, continues to be a priority and can facilitate fiscal adjustment. That is also clearly the case in core areas for sustainable and inclusive growth such as public investment, health and education. Three, it is important to put in place fiscal frameworks that help countries save during good times so they can protect spending during bad times. In commodity producers, this saving has to strike the right balance between accumulating financial assets, investing in physical infrastructure, and investing in people through health and education spending. Moreover, it is essential to start now in implementing a more robust framework that can help countries deal with the uncertainty that lies ahead. And four, the quality of institutions is crucial. Fiscal rules and procedures are important, but they need to be underpinned by a broader social and political commitment to adhering to these rules and laws. These pillars are important for all countries, but they are especially crucial in resource-rich countries where the conditions for managing public finances are much more challenging. And the Fund remains committed to assisting its membership in building these pillars, not just in the analysis I am presenting today, but in the context of its regular policy dialogue with countries, and the extensive technical assistance we provide.